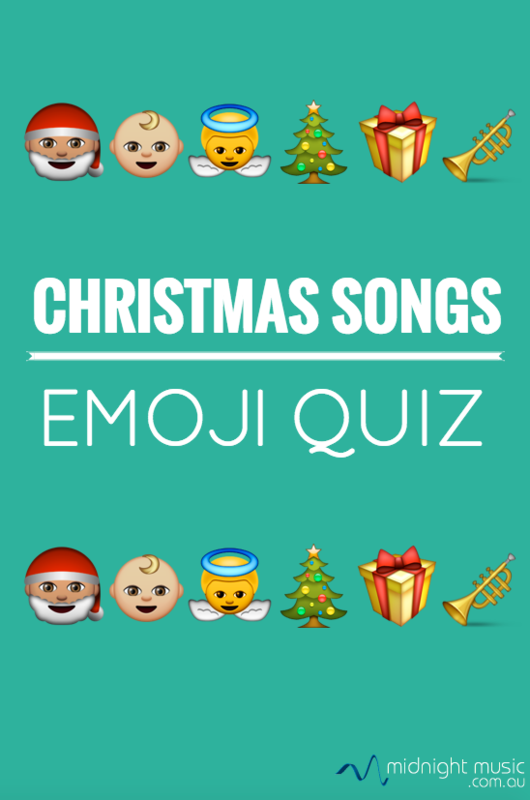 The Christmas Song Emoji Quiz! 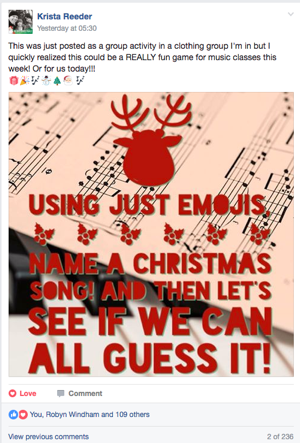 During a past holiday season, I noticed that a post in the Music Teachers Facebook group was getting a lot of attention. 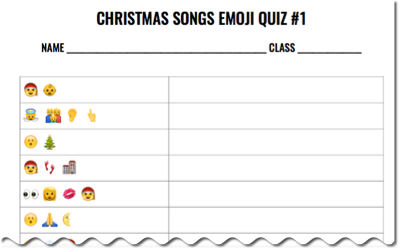 Teacher Krista Reeder invited everyone to take part in a game of “guess the Christmas song” by using only emojis to depict the title. A couple of hundred comments later, there ended up being quite a decent list of emoji songs! I thought it might be useful to collect them and put them into a worksheet format for students in class (you can download this, below!). I’ve split the songs into two separate quiz worksheets – verion 1 and version 2 – and each have a different series of questions. Use them this year, and save the worksheets for next year and beyond! Click on the download button below and we’ll send a copy of the quiz to your email inbox. You’ll also receive weekly music tech tips and opportunities for free PD (if you don’t already). You can unsubscribe at any time. If you have young students that might struggle to answer the questions, you could print out the answer sheet, cut up all the questions and answers and play a game of “match the song to the emojis” (perhaps with just a handful of songs that you are confident they know). I got my download link, but I keep getting “This site can’t be reached.” Is there another option? I would love to have my 6th grade try this tomorrow! Hi Lisa! I just tested it and it’s all working for me here. Once you’ve entered your email address, you’ll receive a message with the download link. When you click on that, the file starts downloading (goes straight to your downloads folder). It takes a while because the file is 4.7MB (due to all the emoji images in it!). Perhaps check your downloads folder to see if it went there? Like Lisa, I, too, got the following message. Hopefully, there is a quick fix, I was excited to try it and get it ready for Thursday. Thanks, Katie for all the cool stuff you put together for us. Hi Mary – sorry to hear you had problems. I’ve sent you an email with a direct link in case that works better! I received the e-mail, but the link only brings me back to this page. There is nothing to download. Hi Erika – sorry to hear you had issues. I’ve sent you an email with a direct link in case that works better! I’m having the same problem. The e-mail sends me back to this page, and when I click “download quiz”, all I get is the popup to enter my e-mail. Then it sends me an e-mail back to this page, and I continue the loop. Hi Kathy – sorry to hear you had problems. I’ve sent you an email with a direct link so hopefully that will work ok! The last 2 mailings I have not received download links when I sent for them. I have checked in Spam and Junk folders but nothing. The answer sheet is in the download – it’s a single PDF with multiple pages. The first one is part 1 of the quiz and then the second page is the same thing, but with the answers. The 3rd and 4th pages are part 2 of the quiz. Nevermind! It went into my Spam- got it! THank you!! Good to hear you found it!